This is a recipe that I threw together last week. I normally make a big green salad at the start of each week that I use for my work lunches and dinner side salads. I was looking for something new that was versatile, could be made ahead of time, and refrigerated well. I came up with this chilled salad, which is a great addition to lunches, a great salad topper, and perfect for summer picnics and barbeques (for vegans and carnivores alike!). 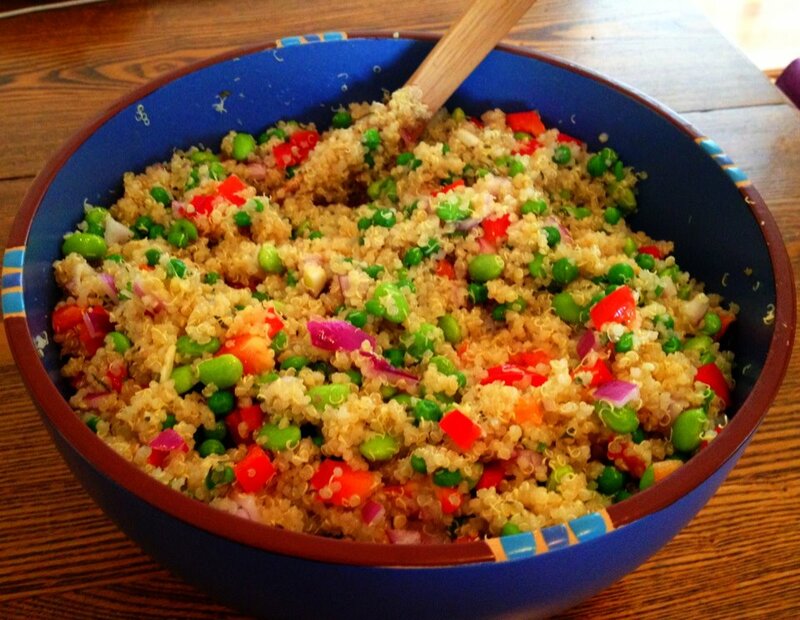 For those of you who aren’t familiar with quinoa… you should be! It’s inexpensive, quick and easy to make (about 10 minutes), and very versatile. Because it is slightly bland on it’s own, you can transform it into any flavor palette you are working with, no matter how simple or complex — it’s like the blank canvas of grains. While I love my whole grain pasta and brown rice, quinoa has an advantage over them both, since it provides 9 essential amino acids and is therefore considered a complete protein. For vegans, this is essential, since complete proteins obtained from non-animal foods tend to be scarce. 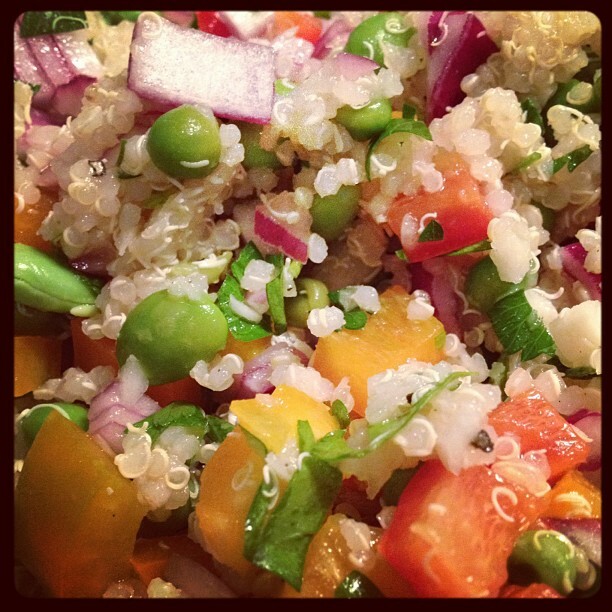 The edamame in this salad is also a complete protein, which makes this an extremely nutritious and powerful side dish! Quinoa can now be found in most large supermarkets in the natural foods aisle, and when it’s on sale, I stock up. I like the Ancient Harvest brand because it doesn’t require rinsing the quinoa before cooking it. Feel free to use this recipe as a base, adding or omitting whatever you like. I think it would also be great with some seitan or soy chicken tenders if you wanted to beef it up a bit. It’s also a great way to use up any vegetables you might have on hand. You can also make this without the dressing, using salad dressing or your favorite vinaigrette in each individual portion. 1 tsp mustard (optional) – I had a jar of Stonewall Kitchen Wasabi Mustard on hand, so I used this. Prepare quinoa according to directions on the box. Combine all salad ingredients in a large mixing bowl. Whisk together olive oil, vinegar and lemon juice; add garlic, salt and pepper, and stir. Pour over salad and stir until combined well. Oh snap, thanks so much for posting this! It is gonna help me when I get Quinoa Pasta at the market! Outstanding!